New York, NY - May 22, 2013 - Alive Mind Cinema is proud to announce the DVD release of A Good Day To Die , a documentary produced and directed by David Mueller and Lynn Salt that tells the life story of Dennis Banks, co-founder of the American Indian Movement, and explores the events surrounding the formation of the movement. Alive Mind Cinema will release A Good Day To Die on DVD on May 28th, with a SRP of $29.95. The DVD release includes bonus material featuring deleted scenes and the theatrical trailer. 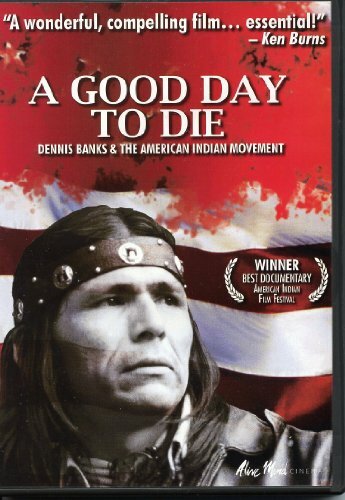 A Good Day To Die chronicles the rise and fall of the American Indian Movement, which was founded in 1968 to advocate for the civil rights of American Indians. The movement sought redress for numerous grievances of American Indians, from forced assimilation in boarding schools to neglect from government agencies such as the Bureau of Indian Affairs. At the center of the movement was co-founder Dennis Banks, whose own involvement included armed confrontations at Custer, South Dakota and Wounded Knee, representing Banks' position as a steadfast leader for the American Indian Movement. Directors David Mueller and Lynn Salt capture the deeply personal struggle at the root of the American Indian Movement, and tell the bittersweet and compelling story behind the American Indians' struggle for civil rights. A Good Day To Die has won Best Documentary at the American Indian Film Festival, the Grand Jury Prize at the Santa Cruz Film Festival, and Best Documentary at the International Cherokee Film Festival. Specializing in documentaries in the areas of enlightened consciousness, secular spirituality and culture, Alive Mind Cinema seeks to provide audiences with intellectually provocative films that deliver the "aha" response of a transformative experience. With a library of 700 titles, Kino Lorber Inc. has been a leader in independent art house distribution for over 30 years, releasing over 20 films per year theatrically under its Kino Lorber, Kino Classics, and Alive Mind Cinema banners, including four Academy Award(R) nominated films in the last six years. In addition, the company brings over 60 titles each year to the home entertainment market with DVD and Blu-ray releases as well as digital distribution on all platforms.